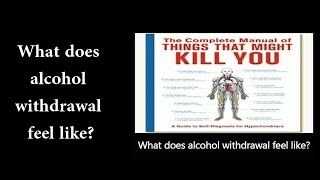 What does alcohol withdrawal feel like?, Before we get into this video let me say that if you are in any doubt about your health, you should visit your doctor. Most of the danger in quitting alcohol is down to the years that you have been drinking the stuff, the damage that has been caused by this poison over those years, and the way your body has habitualized itself to the alcohol. If you can stop using alcohol for a couple of days without any symptoms, you are very likely to be able to quit for good with no danger to your health. Your danger comes when you continue, not when you stop. As I said, if in doubt go see your doctor. It will take you a couple of hours max. My Experience – Drinking Was KILLING me! So first of all to talk about my own experience with withdrawal, it wasn’t DANGEROUS – drinking for me was DANGEROUS. I started drinking when I was 13, which is DANGEROUS. And I drank all the way through my teens, which was DANGEROUS. I drank through my 20s and 30s and well into my 40s. So, over 35 years drinking is very DANGEROUS. When I quit I didn’t go into rehab, I didn’t go to the doctor, I didn’t take any medications. I did it on my own, without any outside help. So as of today, been off the drink now for 10 months, I’m way more a fitter person and way more healthier. I can think clearer, I’m eating better, and I’m sleeping better. And I’m having better relationships with my family, with my friends, than I ever did before. And yeah, I’m pretty DANGEROUS now. The Statistical Comparisons – Where’s the Real DANGER? I’ll give you some statistics here. There’s 80,000 lives which are directly lost through alcohol every single year. That’s 2.3 million years that are potentially lost. That’s 30 years per person for those 80,000 lives. And that’s not including the people that are killed on the roads because of alcohol, people that are killed in homes because of alcohol, people that are killed just as victims of crimes because of alcohol. First of all you’ve got the DANGER from the drinks industry who wildly promote their product. Then you’ve got the DANGER from the anti-drinks industry, the ones who are so-called trying to help you to stop, who are wildly promoting their detox products and are DANGEROUSLY claiming that only people who go through their programs, who go through detox and who go through medical supervised programs can be sure of having no DANGER. Every year in the US there is 1.2 million emergency room visits because of alcohol. There’s 2.7 million doctors’ visits because of alcohol. And quitting drinking is DANGEROUS? Is the DANGER in Quitting? Now I’m not saying that there isn’t a certain element of DANGER in for some people in quitting drinking. But if 75% of people can successfully quit drinking without going to a doctor, then the DANGER is obviously not there for everyone. The DANGER is there for somebody who gets up in the morning and all he can do is drink alcohol. All he thinks about is drinking alcohol. His life is drinking alcohol. That’s not who these videos are for. These videos are for people who got problems because of their drinking. These videos are for people that have been able to stay off the drink for maybe a day or two. I mean a drink only stays in your system for 48 hours – at MOST. The liver can deal with one unit of alcohol per hour. So 48 hours, everything is gone. If you can stay off the alcohol for 48 hours, you’ve essentially quit drinking. Even if you got back on it again, you’ve quit drinking. So you’ve proved to yourself that you can do it. So hope you can see the real DANGER is humans consuming alcohol. Humans quitting alcohol – there are very few DANGERs in that. People die from running marathons. People die swimming. People die doing things every day that you wouldn’t think people would die from doing. There’s DANGER in everything. So do I know that quitting alcohol is DANGEROUS? Before we get into this video let me say that if you are in any doubt about your health, you should visit your doctor. After days of binge drinking, I stopped cold turkey and after about 24 hours started feeling crazy symptoms I've never felt before. My chest felt like it was tightening, started hearing "boulders falling", was seeing black spots at the corners of my eyes, and was 100 percent convinced I was going to die any second. Heart rate was up the wall. Was seeing gold and bronze every time I closed my eyes, and was actually begging for my life. Screamed. Came out of it extremely disoriented. Next day, felt like a nightmare on its own. Was VERY paranoid and felt that at any moment my mind would go back into that state. Flick of a switch. Was also getting scarier, more profound auditory hallucinations, like voices degrading me. they admitted her immediately, had a other seizure in he ambulance….